It seemed like just yesterday that Gina Rigoletti had last spoken with Logan Barnes. Instead, she had been a teenager, leaving to go away to college. Leaving him and what she knew could never be. Now she was an adult, had become an expert in her field, and her newest patient was Logan's young son. Although she would typically assign the case to someone else, Logan wanted only the best for his son, and the best meant Gina. He knew having her in his life again would be difficult, but the memories were sweet, and watching her with his son even sweeter. Still, he could not forget that she had left him, when he had offered her everything. Gina was haunted by the memories from that time. She had known what could happen if she stayed, known that she needed to go to school and get her degree. There were darker memories as well, an assault she hadn't reported. However all these thoughts melt away with Logan. He is safe, familiar, someone she can trust. And someone she can love. 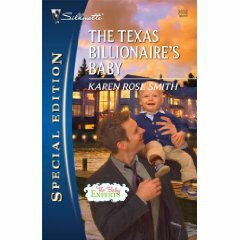 The Texas Billionaire's Baby was a touching reunion story. For many reasons, Gina needed to go to college, but misunderstandings had kept Logan and Gina apart. I'm always a sucker for this type of story, and loved watching them fall in love all over again. This was the forth story in what is now the six book Baby Experts series, and I look forward to the last two. FTC Disclaimer: I did receive an ARC directly from Karen Rose Smith. However, this website only posts "good" reviews. If I cannot post a positive review, I notify whoever has provided me with the book/ARC/ebook.